MasterChef, Socceroos score on Tuesday. The Socceroos ended their FIFA World Cup run last night when they lost a match to Peru, which is ultimately bad news for SBS as well as fans. The late game which stretched on past 1am pulled 842,000 viewers, around half who had watched previous matches. 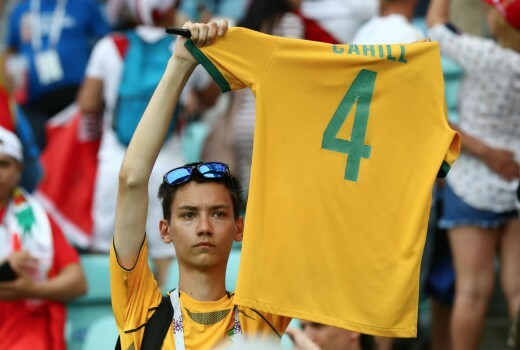 The game was unique for Tim Cahill’s salute as the first Socceroos player to compete in 4 FIFA World Cup events scoring 5 of our 13 goals. At an impressive 938,000 MasterChef Australia finished well ahead of House Rules on 756,000 while Buying Blind continues to trail on 519,000. Shark Tank also won for TEN at 610,000 ahead of Interview and Back in Time for Dinner. Seven News, ACA and The Chase won earlier slots. Seven network won Wednesday with 29.5% then Nine 24.5%, TEN 20.7%, ABC 14.0% and SBS 11.2%. Seven News was #1 with 1.11m / 1.09m for Seven then Home and Away (766,000), House Rules (756,000), The Chase (644,000 / 408,000) and Interview (522,000). Swipe Right for Murder was 207,000. Nine News (955,000 / 980,000) led for Nine then A Current Affair (847,000), Hot Seat (580,000 / 347,000), Buying Blind (519,000) and Movie: Ocean’s Twelve (254,000). MasterChef Australia won its slot with 938,000 then The Project (631,000 / 370,000), Shark Tank (610,000), TEN Eyewitness News (445,000) and Family Feud (334,000). NCIS: LA was 217,000. ABC News (666,000), Back in Time for Dinner (488,000), 7:30 (460,000), Making Child Prodigies (309,000), Think Tank (243,000) and Sue Perkins and the Chimp Sanctuary (198,000). FIFA World Cup Aus v Peru pulled 842,000 for SBS followed by Who Do You Think You Are? (263,000 in 4 cities), Insight (252,000), Dateline 172,000 and SBS World News (140,000). Outback Truckers topped multichannels with 229,000. Love Island was 185,000. OzTAM Overnights: Tuesday 26 June 2018. Tags: 7:30, A Current Affair, ABC News, Back In Time For Dinner, Dateline, Family Feud, FIFA World Cup, Home and Away, Hot Seat, House Rules, Insight, Interview, Love Island, Making Child Prodigies, MasterChef Australia, NCIS: LA, Nine News, Outback Truckers, SBS World News, Seven News, Shark Tank, Studio 10, Sue Perkins and the Chimp Sanctuary, Swipe Right for Murder, TEN Eyewitness News, The Chase, The Morning Show, The Project, Think Tank, Today Extra, Who Do You Think You Are? I’m a school teacher – there were a lot of subdued kids trying to take naps in class today!! Just wondering why spoilers for Wentworth are allowed in this ratings post. Yes I realise it has aired but Wentworth is not even mentioned in this article. I thought I was safe to read this post without being spoiled. Surely these comments should be in TV Lounge? Cheers. Strictly speaking it would have been better in TV Lounge or the ratings rankings for Tuesday, which includes Wentworth numbers. I would agree re Wentworth – this post relates to free to air network ratings so no need to mention here. I too have not seen last nights’ episode so do chose to avoid anything where someone might write about it like TV Lounge, the daily ranking post which has Pay TV top 20, etc until I’ve seen it. Here, I ready comments from latest to earliest, so as soon as I see a spoiler mentioned from earlier comment I just stop looking. Sorry didn’t realise this page only focussed on Free to air shows. I have previously been told that once a show has aired then it is not considered a spoiler on this site. It’s not a spoiler as it has aired, which is why it was approved. It’s more a question of whether off topic or not. Rarely I will include an STV rating in the daily wrap if noteworthy, but 90% of the time not, so the rankings or TV Lounge probably a better fit. Perhaps my error in not asking you to resubmit on another post. Ultimately it’s one of those falls-between-the-gaps moments but I accept the feedback and shall have to spend the day in the moderation naughty corner. Unless comments have been removed I can’t see any spoilers? Wowsers what an epic Wentworth last night. Sonia’s shower scene, my gosh!!!! She went ‘bunta’ on her!! Hope Franky is okay, absolutely love Ruby too. So many interesting story lines coming up, bring on next week. Back in Time for Dinner was great as always last night. Poor Jeff the fish, and the kids watching their parents’ wedding video – hilarious! I enjoy this show, and I very much like Annabelle Crabb, but I do find myself wondering when I watch this if it actually needs a host. Yes, good point. The family would do a great job hosting themselves.